The 3.5-inch Super-Ride suspension system is an ideal system for the discerning XJ Cherokee owner who desires a more aggressive look, higher ride stance and better trail performance, but still wants to retain factory like on-road handling and ride quality. The replacement Rubicon Express Super-Ride lower control arms eliminate the weak factory control arms, without inducing any additional road noise or vibration. The Rubicon Express 2″ Standard suspension system for the XJ Cherokee offers a great performance at an immense value. The 2″ standard system for the XJ is the quickest and easiest way to boost your Cherokee’s height noticeably while barely making a dent in your pocketbook. The 4.5″ Rubicon Express Exteme-Duty Suspension is your system of choice if you desire a substantial increase in ground and tire clearance, as well as greatly increasaed suspension flexibility. This system features RE Extreme-Duty leaf springs, which are unmatched for durability, flexibility and ride quality. Greaseable shackles and main eye bushings are included on the Extreme-Duty System. This 4.5” system will maintain the classic Jeep YJ ride characteristics while allowing you to run 33” tires, (Adding a 1” body lift will allow the use of 35” tires). Installing a SYE and CV driveshaft will be necessary. The Rubicon Express 4.5″ Super-Flex suspension system for the XJ is designed as a complete suspension system replacement. 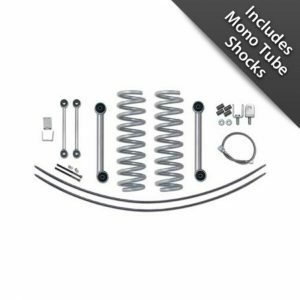 The stock components of your Xj’s suspension are upgraded with Super-Flex front control arms (allowing for proper caster adjustments), front coil and rear leaf spring and all the other components required to outfit your Cherokee with superb 4.5″ suspension lift system.